Shapeshifting, friends-to-more...what's not to love? Love Me, Love Me Not has a gorgeous cover. I'd love to have this one on my shelf. So pretty! Beyond that, this is a pretty solid YA read. I love the worldbuilding around the swan and fox shifters. There's a satisfying sense of history between these two feuding groups, with layers of tradition built into both the feud and the daily lives of the shifters. While there was a lot that wasn't explained or entirely spelled out, I did have the sense that there were reasons behind the different elements of the world, and that was enough for me in this short book. I thought that the romance was really sweet, and I was cheering for it to work out. I especially loved having Pierce's perspective in this book. The pining really got to me. What a lovely guy! I loved the friendship between Pierce and Ana, and his fascination with her family. We all need people who are so supportive in our lives. I also thought that Ana's desire to find love was pretty easy to relate with, even though her need is specifically tied to being a shifter. The only problem I really had with the book was the balance in this world. There's this deadly hostility between swans and foxes (and we see several examples of it), but somehow all these kids are still attending school together? And how the heck do any of the teens have the time to balance school and their obligations as shifters? Ana mentions that many of her cousins were homeschooled, which I guess would help get around this issue, but it's clear she's not the only swan-shifter at school, and certainly there are plenty of fox-shifters. Still, because the story was so much fun, I was willing to suspend my disbelief and go along for the ride. 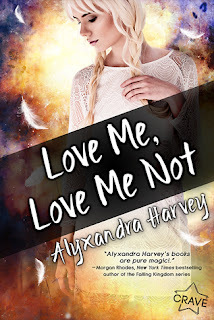 I was entertained by Love Me, Love Me Not, even when I had issues with the timing of everything. I'd absolutely recommend this one to fans of YA paranormal, particularly if you're looking for a quick read!